Why Do You Need an Observership in USA for IMG? An observership for IMG in USA is a way for foreign graduates to become acclimatized to how everything works within American clinics and hospitals. Through and Observership you get the chance to shadow a doctor within a US hospital for usually a full month allowing you to see not only how patients are treated but also how everything works within the administration of the hospital also. What about other opportunities? Check out medical residency in UK for IMG to compare with! Learn more about the English language including slang and other expressions. For an IMG (International Medical Graduate), winning the Observership, fellowship or residency in some reputed hospital or clinic of United States is not a difficult job, nevertheless, the applicants follow the guidelines of that particular institute very seriously and to complete the required documents with full devotion, responsibility and care. Many applicants do complaint that it is very hard to qualify for the Observership, fellowship or residency in any one of the famous US clinic or hospital. Remember! The entire story is about being very clear about the required documents and to get the help of some expert for completion of these documents. For all International Medical Graduates (IMG) who want to avail the opportunity offered by some famous US institutes regarding Observership, fellowship or residency, the list of required documents is almost same. Of course, the aim behind getting admission in any one these program is different; the persons who want to join Observership has the clear aim of getting familiar with US medical system and to learn about doctors’ interaction with their patients. However, the aim of students who apply for the fellowship program in the US is simply to support a renowned doctor in his on-going research work. While the students, who apply for the residency program, want to do practice with the famous doctors in their routine check-ups and normal operations as well. An application equipped with letters of recommendation, personal statement, educational certificates, passport copy and updated resume. J-1 Visa sponsored by ECFMG (Educational Commission for Foreign Medical Graduates). U.S Medical Licensing Exam (USMLE). The documents required for Observership application are the same as required for fellowship and residency program; these documents are ECFMG certificate that is necessary to get J-1 Visa, U.S Medical Licensing Exam (USMLE) and the application that must be equipped with educational certificates, two letters of recommendations and writing personal statement residency. However, those Non-U.S. citizens who have passed the US Medical School exam even from their own country and sponsored by an F-1 Visa, are considered to be exempted from ECFMG exams, nevertheless, ECFMG will sponsor the J-1 Visa for these graduates. Such students only have to clear the standard USMLE. This is obvious that you cannot change your mark sheet and educational background, so the only thing that can present you as the right candidate in front selection committee is the way of artistically designing your LoR and personal statement. The more powerful will your LoRs and personal statement more will be the chances of getting admission in Observership, Fellowship or Residency. Getting ECFMG certificate and USMLE is fully dependent upon your skills and preparation to solve these tests. However, to write the LoR and personal statement, you should take help from some professional agency because these are the documents that have maximum weight among all other documents that you will submit to apply for Observership, Fellowship or Residency. The most important advice to ensure your admission in desired Observership, Fellowship or Residency program of US institute is starting the preparation of documents much earlier even before the announcement of admission opening. You can take all information from the website of concerned university or hospital and can start finding the right source of getting best possible LoRs and personal statement. Remember! If you are ranked in IMG category for getting admission in Observership, Fellowship or Residency program of US institute, then the most special feature of your application is nothing but to make a unique and awesome personal statement and letters of recommendation, read about USMLE personal statement too. You should never compromise upon the quality of these letters and should definitely get help from some experts. This is what that will ensure your admission in your dream institute. 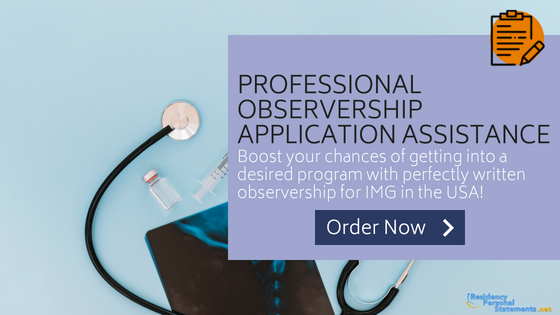 Your application should be made at least 3 to 4 weeks before you wish to attend an observership in USA for IMG but you should check each individual website for their specific guidance. Also, ensure that everything that you submit is written in good English if you do not want to be rejected. Moreover, it’s worth visiting our site where you may get additional information about pros and cons of medical observership. Need professional observership application assistance? Writing your application is not going to be easy, especially if your command of the English language is not perfect. Our expert and highly dedicated service will help you to ensure that your application is delivered on time and that it is written perfectly ensuring that you stand the best chances of being accepted onto your chosen observership program. Apply for your chosen observership in USA for IMG program through us and we will ensure that your application is perfect in every way!